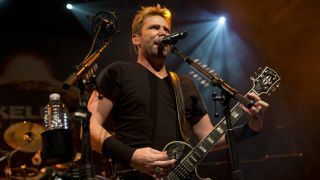 Nickelback have revealed their upcoming album is titled No Fixed Address because it was written in various locations across the world. This week, he responded to negative tabloid rumours surrounding his marriage to Avril Lavigne, calling them “very amusing” but said speculation upsets his family. The Canadian rockers launch their eighth album, the follow-up to 2011’s Here And Now, on November 17. They’ll then head out on a 60-date North American tour starting in February.